Hawksmoor Apprentice – you’re hired! Hawksmoor apprentice Lewis Bird has had two reasons to celebrate recently. Lewis started his Apprenticeship with Hawksmoor Investment Management in October 2016, when he was taken on by the Exeter Office as a Trainee Investment Administrator. 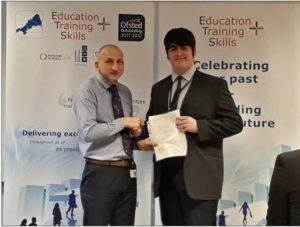 Just over a year later he completed his Apprenticeship, and earlier this week was awarded his certificate during a presentation ceremony at the Education Training and Skills headquarters in Exeter. In addition to the successful completion of his Apprenticeship, Lewis was offered a permanent position at Hawksmoor as a Junior Investment Administrator.